June 6, 2006 Zarauz to Deba 37,890 steps! Breakfast in the hotel and then off on the road -- the day was another beautiful sunny day with the hills looming in the horizon as we wove our way out of town. 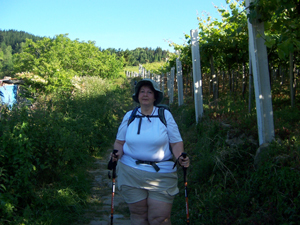 Very shortly, as usual, the Camino veered off in an upward direction. The pathway left the paved roadway and started its endless trek of cobblestones turning to "roman way" to rocky path as it ascended up and out of the town of Zarauz. Fortunately it was early and the legs were strong for the path took on a 14-18% grade with little relief other than an occasional spot in the shade. Step by step the group pushed forward. Angela and Frankie had already decided to only go as far as Zumaia allowing themselves additional time to make their goal. The rest of the group knew it would be a long day and continued on at a slightly faster pace. However, both groups faced the same topographical phenomenon. The first seven kilometers were up for two kilometers, down for two, back up for two, down for two. Now to the reader that may not seem like anything too difficult or challenging -- let me assure you that it is truly a test of one's will to continue. It is not the terrain that wears you down -- although it does contribute to the story -- it is the wear and tear on your body that cause the mind to question the sanity of such a trip. The "ups" pull at your lungs as each breath becomes harder and harder to do in a normal rhythm. They cause a waterfall of sweat that pours over your eyes as you try to focus on the pathway ahead. They pull at the backpack reminding you that gravity on earth pulls downward. The "downs" send the toes smashing to the front on the boot driving a sharp pain up the big toe. The bottom of the feet burn with the constant fiction of the socks sliding back and forth. The knees feel the pressure of each step and the arms try desperately to balance the body with the poles. So is the way of the Camino! Is it worth it -- of course, it is!!! There is a phrase, "no pain, no gain" and it fits very well here. We all know as the days turn into weeks the pain will lessen and the gain will grow. Like anything in life there is always a learning curve and the beginning is more challenging than the conclusion. We are on the road up the curve! 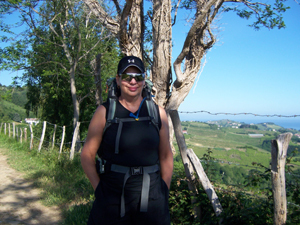 Enough of the philosophy for today -- back to the Camino: After Zumaia the pathway once again returned to the constant upward wind through the countryside. At times we were on paved highways and small country one lane roads, but most of the time we found ourselves crossing through farmers' land among the sheep and cows and occasional goat. We must be a sight for sore eyes, because each animal seemed to want to avoid us!! At one point the path narrowed into a steep muddy dirt trail that followed a small stream. Watching one's foot placement is critical when walking a slippery muddy ridge, but the view down to the sea was breathtaking. The foam of the waves crashing against the rocks far below created a white outline along the shoreline. The greenery of the hillside seemed to just flow into the outline and out to sea. Blue sky, green hills, white foam, and blue-green water -- fabulous. A good reason to rest and take in God's creation!! It is amazing what an orange can do for the body when any thought of finding the needed energy to continue seems impossible. Oranges were invented for the pilgrim -- I am convinced!! One slice and back to full power. From Zumaia to Italiar, a distance of nine kilometers, the ground rose 300 meters!! You do the math as to how fast we were ascending! Then from Italiar to Deba we dropped 300 meters in three kilometers. Sort of like jumping off a cliff! Deba is a resort town on the coast with expansive white sandy beaches stretching out in all directions. The group was divided between two hotels, but both were only a block from the waterfront. Upon arriving on the outskirts of town we discovered that the pilgrimage route had been modernized some. The yellow arrow pointed to an outdoor elevator that would take us down the 20 stories to the mid-point of the cliff we just reached. Exiting the first elevator put us in front of another which delivered to sea level. A vacationer, a middle aged gentleman took pity on us and walked us through the town directly to our hotel -- which of course was on the other side of the city and slightly uphill! We aren't sure if he was being a good Samaritan or just interested in picking one of us up. In any case, tired and very weary, we arrived in Deba. It was a very early night -- seven very tired pilgrims -- snoring was allowed this time!